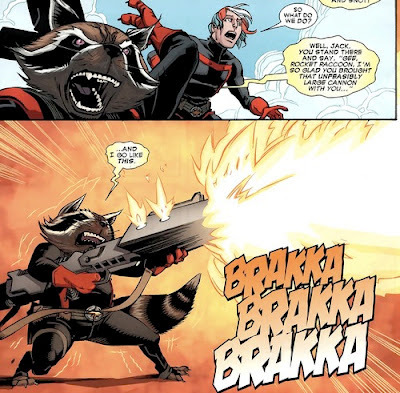 I know it's not dignified for a grown man to get giggly about a talking raccoon, but I must admit that I am nothing but pleased to see Rocket Raccoon show up at the end of Avengers Assemble #4. I know there has been bitching and moaning about how this particular Avengers book is not in mainstream Marvel continuity. 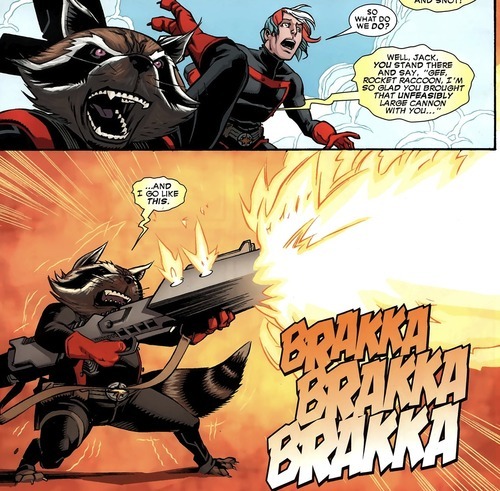 But personally I am glad for any excuse to put Rocket Raccoon and the Guardians of the Galaxy back on comic book pages instead of just languishing in Comic Character Purgatory. While the main Marvel continuity was drowning us in the bleak and dark depression that was Civil War and that Skrull Invasion stuff, Guardians of the Galaxy was fun and wild and interesting, and you knew who the heroes were. I am a sucker for telepathic cosmonaut dogs and talking raccoons with GIGANTIC GUNS! And it is good to see Peter Quill, aka Star Lord, back from the dead. 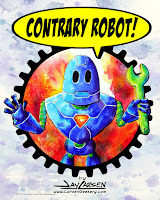 I like my comics goofy and over the top! So I'm Geeking Out about the return of Rocket Raccoon! Look Who Will Be at GeekGirlCon!